There is no system of education in chess. There was a system in former USSR (and it gave great results), but that has long passed. A chess player (or a chess teacher) is a job; and the same applies to all other professions, it requires a special system of preparation. In order to progress in chess, you need to not just train, but to train the RIGHT things. 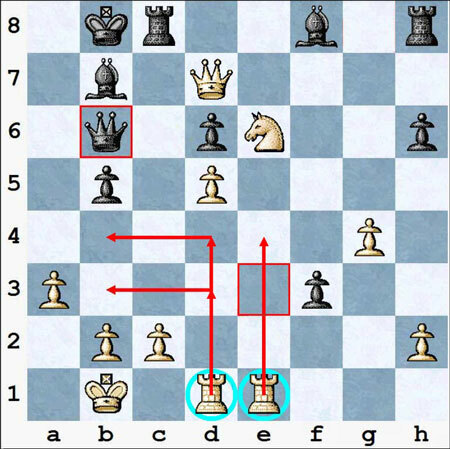 You need to have a training program (training plan), which will give you a comprehensive system of chess knowledge. You need to acquire the necessary skills at the right time. Also you need to use EFFECTIVE training methods, which REALLY give you improvement. It is my intention to help you with for this purpose; I have developed a special course “Self-taught Grandmaster”. Live in a small city. Don’t have a chess coach. Don’t have a lot of time for training. Don’t have an opportunity to play in strong tournaments regularly. Want to get MORE benefit out of your training. Then my course is exactly for You! Now you can get the most effective training methods, which have proved its high efficiency. I will show you WHAT to do, HOW to do it and what MATERIALS you should use. You will get a clear guide, a clear map for your chess progress. 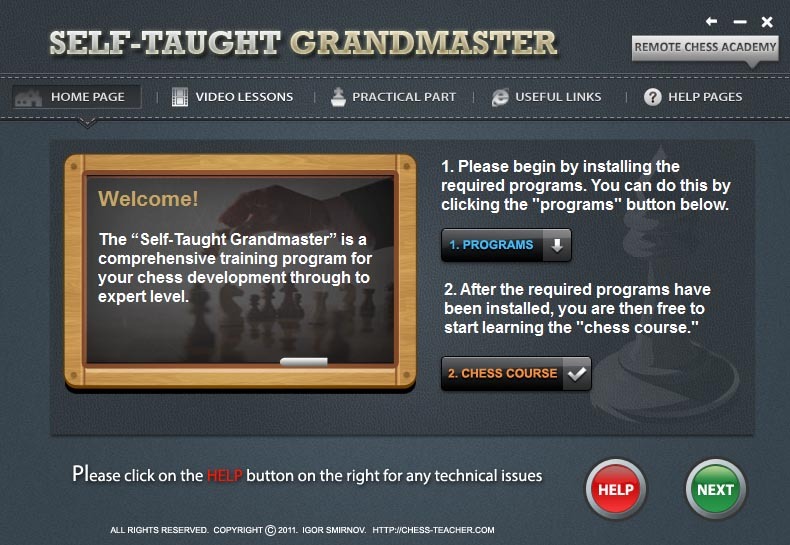 Chess course “Self-taught Grandmaster” contains the video lessons. Lesson-1: “How to Use Your Brain Effectively”. It will help you to improve ANY skill (NOT just chess skills) effectively! The common mistake of chess players, which prevents them from getting a real benefit out of their chess knowledge. What is the fastest way for chess progress? Here I will share with you the most effective training methods in chess. They will make your study effective and your progress constant. The key idea of the Botvinnik-Kasparov chess school. How to get benefit out of blitz games and tactical puzzles? The best FREE program for chess databases. Where to find the HIGHEST quality chess games. The best chess engines (and how to get them for FREE). 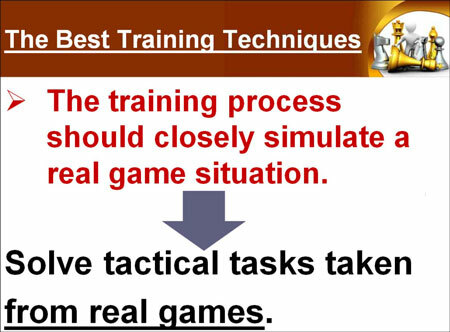 What is the best way to improve your tactical skills (99% players don’t know it). In the next few lessons I’ll tell you WHAT to study. I will give you a complete training program from the beginner to expert level. In this lesson we will analyze the 1st block called “+300 Spurt”. It means that from the start you can get about 300 rating points relatively quickly. It works for players under 1700 and sometimes even under 2000 rating. This training block will make you a good intermediate player. I’ll tell you the main problem of self-trained players (and how to overcome it). You’ll know exactly how (and why) stronger players win against weaker opponents. The bottom line is this: your chess results will become STABLE. This is a necessary factor for your further chess development. What is the main difference between a strong and an intermediate player? You will get a list of topics that you need to master (for printing). I will recommend you some good books for this level. We will fix your chess weaknesses. You will improve your opening knowledge. You will develop your special style of playing. And you will improve your planning skills. The “High School” makes you a strong player and you will probably become a titled player after that. After studying “High School” you will become a strong player and start taking part in strong competitions. Then you will be faced with a new problem: How to beat strong players? What if I only have a limited amount of time for chess training? The practical part will help you to turn your knowledge into practice. After a performing of a special set of training tasks, you will really get the appropriate SKILLS. This way you will get better in chess right after studying the course. Here I will explain to you in detail the Grandmasters’ way of thinking. Thus you will be able to copy it and to get the same GMs’ results! One of the biggest problems concerning chess teachers and authors is a lack of responsibility. Chess teachers (authors) do NOT care about your progress. Your chess results may not change or even go down – no one cares. Every professional bears responsibility for his work! Everyone! Except chess teachers and authors. Smile That’s why they are NOT really interested in helping you. Someone has to break this tendency. That’s why I give you a firm guarantee. If you study the course “Self-taught Grandmaster” and perform all the practical tasks – you will get chess progress. 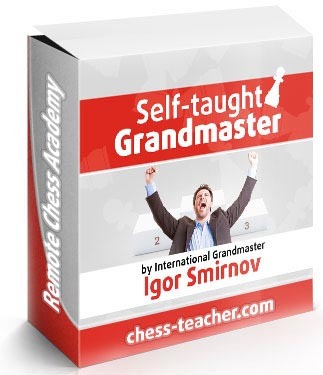 Buy the course “Self-taught Grandmaster” now and study it seriously. Learn the video lessons and complete all of the practical part tasks (following the corresponding instructions). Then apply these skills in your practical games. 142 minutes of video lessons. Text versions of every video lesson. The best training techniques and materials. 200 commented games and training puzzles for your training. My database of 100 000 computer games. The answers to all your questions about chess training. You can spend such amount for 2-3 hours of training with a private teacher.OR you can get a comprehensive training program for your chess development till an expert level! The first training block already gives you approximately 300 rating point increase in 3-4 months!A lot of my pupils achieved this result already. The training program consists of 4 blocks.